Learn more by clicking on one of the past Mother Superiors. In a spirit of service, the elected community leadership team promotes the goals of the congregation and facilitates continual renewal, to assist members in responding to societal needs. The leadership team is responsible for listening to, interpreting and guiding the life of the congregation. In administering to the congregation, the team provides spiritual and material support and corporately witness to the Presentation ministries. The leadership team is elected every four years, with the next election set for 2023. Sister Carmen initiated and served as executive director of La Luz Hispana in Hampton, Iowa, after having served as Hispanic outreach coordinator of Mercy Medical Center North Iowa in Mason City. 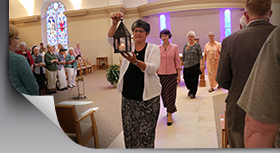 She served as a team member of Caminando Juntos with the Aberdeen Presentation Sisters in Sioux Falls, South Dakota. As vocation director for the Dubuque Presentation congregation she visited Bolivia several times and studied Spanish in Cochabamba. Sister Carmen was an elementary school counselor for the Archdiocese of Dubuque while serving as vocation director for the congregation and as chaplain for the Dubuque Police Department. Prior to that, Sister Carmen was an elementary teacher in Osage, Key West and Dubuque, Iowa. Sister Rita served as a mental health counselor with Catholic Charities for six years (four years full-time and two years part-time). She was the part-time director of Hispanic ministry for the Archdiocese of Dubuque for two years and continues as the coordinator of Spanish Speakers’ Retreats. From 2009 to 2011, Sister Rita was a missionary in Bolivia. Previously, she worked as an in-home family counselor for Mid-Iowa Family Therapy Clinic in Ames, Iowa. Missionary experience of 10 years took Sister Rita to Chupol, Guatemala, from 1990 to 2000. Other positions include high school science teacher in Storm Lake, Iowa, for seven years and junior high teacher at St. Columbkille in Dubuque, Iowa, for one year. Sister Rita has a bachelor’s degree in chemistry and a master’s in clinical psychology. For the past year, Sister Joy has served as the promoter of justice for the Sisters of the Presentation. Prior to that she was the promoter of peace and justice for the Dominican Sisters of Sinsinawa, Wisconsin, for eight years. Sister Joy has been formation director, vocation director and congregational leader for the Presentation congregation. She holds a master’s degree in teaching elementary social studies from Clarke College, as well as a pastoral ministry degree from Loyola University in Chicago, Illinois. In addition to her ministries within the community, she taught middle school and high school. From 1989-1997, she was a pastoral minister at St. Mary Church in Spirit Lake, Iowa. She also spent a year working in the NGO office of the International Presentation Association at the United Nations. Sister Marilyn resides in the Pilsen neighborhood in Chicago and has completed an internship in spiritual direction at the Claret Center. She enjoys walking with others as they discover God in the ordinary experiences of life. She has served as parish director of faith formation for 27 years, most recently at St. Joseph the Worker Parish in Dubuque, Iowa. Sister Marilyn was a member of the congregational leadership team from 1989-1998, assisting with the renovation of the motherhouse during that time. She participated in Ruah, a Ireland pilgrimage to explore the land and heritage of Nano Nagle and Edmund Rice. Her educational experience includes a bachelor’s degree in mathematics from Clarke College and a master’s degree in theology from Notre Dame University, as well as many continuing education opportunities.